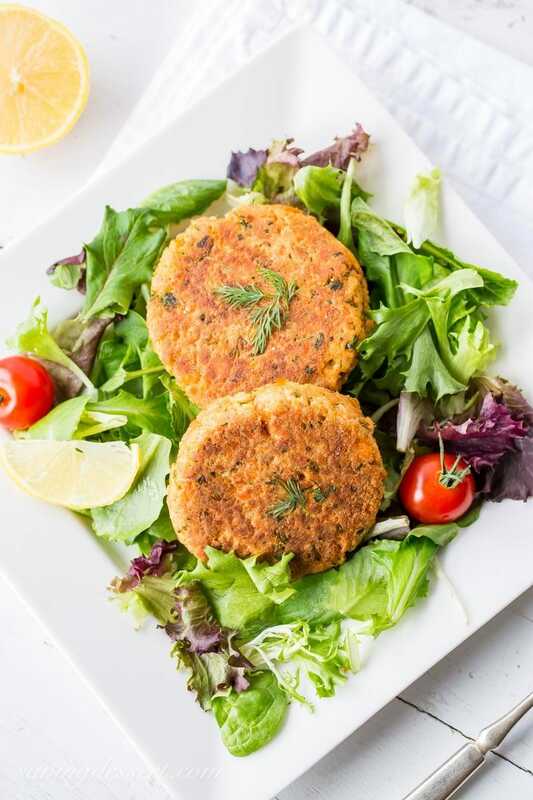 Easy, healthy and delicious, Salmon Patties are a terrific anytime meal loaded with flavor, plenty of protein and are perfect served with a salad or burger style on a bun. Now why haven’t I made these lately? Like in about 10 years. 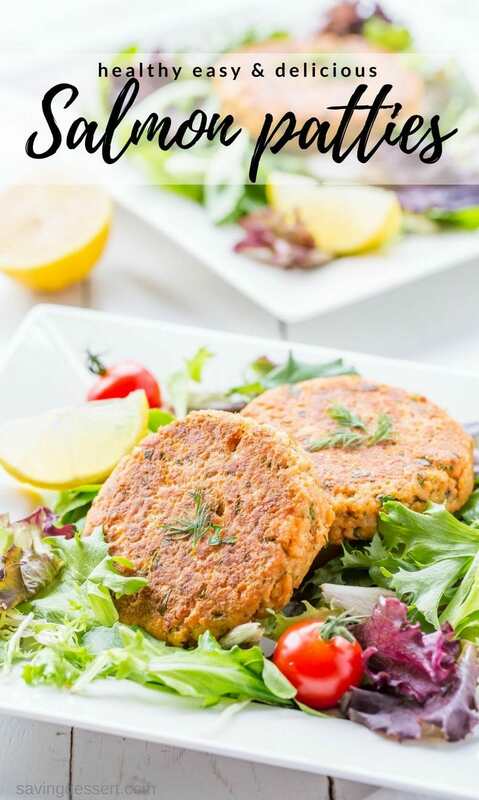 They are seriously easy, healthy and delicious, and, I’ve been craving salmon patties ever since I found an old recipe card. I’ve been trying to reorganize all my recipes that have piled up for the last 25 years. It’s a slow process but I’m finding some things I haven’t made in forever. My mom made salmon patties regularly while we were growing up. She always used canned salmon but you can use any cooked salmon you have on hand. Grilled, baked, pan fried or canned, they’re all great here! Be sure to buy the very best canned salmon you can find, preferably wild caught. I use canned Wild Alaska Red Salmon for this recipe and keep more on hand in my pantry at all times. These are very light, crispy and full of flavor and are back on the regular rotation. This is what you make for dinner when you have no other idea what to put on the table in 30 minutes or less. You’re going to love them! Using fresh herbs makes all the difference in this recipe, so don’t skimp! 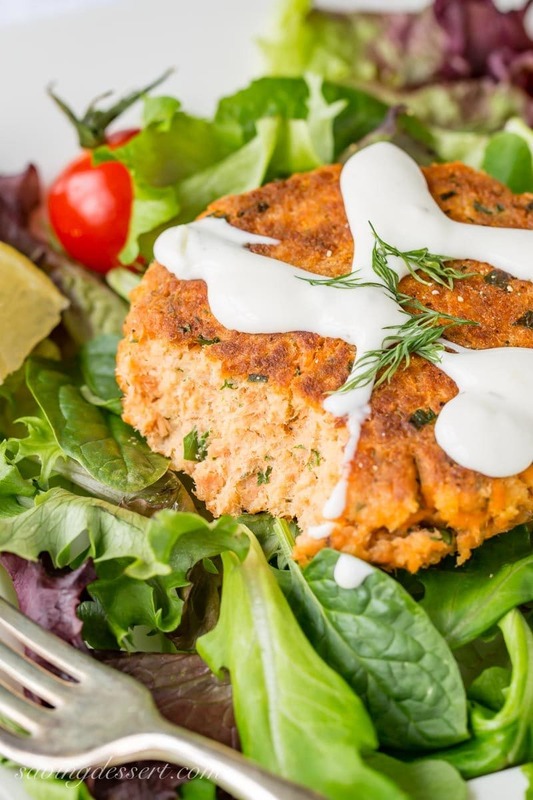 These salmon patties are great topped with a dollop of your favorite unflavored Greek yogurt, or a squirt of cucumber ranch dressing. You an also freeze cooked patties and rewarm at 50% power in the microwave. I love them served with salad or steamed vegetables, but they’re also great on a toasted bun with lettuce, tomato, onion and ranch dressing! 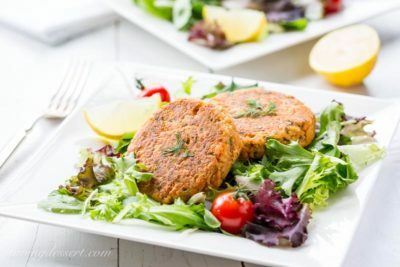 Easy, healthy and delicious, Salmon Patties are a terrific anytime meal loaded with flavor, plenty of protein and are perfect served with salad or burger style on a bun. In a large mixing bowl combine the onion, egg, mayonnaise, pepper, Dijon, seasoned salt, bread crumbs, lemon juice, parsley and dill. Fold together with a spatula to combine. Add the flaked salmon and stir to combine. Form the salmon mixture firmly into 4 patties. Heat a non-stick skillet over medium heat and add the olive oil. Once shimmering, add the salmon patties and cook until the bottom is golden brown. Carefully turn the salmon and cook until both sides are golden brown and crispy. Remove to a paper towel lined plate to drain. Serve immediately garnished with fresh dill, fresh lemon slices, hot sauce, and/or a dollop of your favorite salad dressing if desired. Cucumber ranch dressing is particularly great! Refrigerate or freeze leftover salmon patties. Rewarm in the microwave at 50% power until hot. Salmon is a terrific meal starter and so versatile too. We love our Teriyaki Salmond Rice Bowls with Bok Choy and our favorite Grilled Salmon & Orzo Corn Salad – so perfect in every way! I have been drooling over these gorgeous Rainbow Salmon Skewers from The View from Great Island for a very long time. Another easy must try recipe is this Roasted Asian Salmon and Green Beans Sheet Pan Meal from Kalyn’s Kitchen. Boy it sure looks good! And finally, I would love to try this 10-Minute Maple-Crusted Salmon recipe from FoodieCrush. Dinner never looked so easy! Salmon Patties must be a thing because I just made some too! I love the idea of adding Old Bay! Thanks for the shout-out for my Salmon and Green Beans Sheet Pan Meal! Thanks Kalyn! I really love your salmon! I love salmon patties. My Mom made the best ones.